If you’re woodland loving, Morgan lusting, rustic bouquet wanting, then Bella and Adam’s beautiful day will inspire you. Bella and Adam celebrated their union at Kenton Hall Estate last summer. Anna McCarthy did an amazing job of capturing the day in a very relaxed way. After looking through all of the lovely photographs, Anna clearly captured many special moments. Bride Bella arrived in style, driving her dad (role reversal!) from her beloved Aldeburgh to Kenton in a soft-top Morgan. Her beautiful short lace wedding dress was accompanied by a stunning pair of orange…..Louboutins of course! Adam chose a casual jacket/chino ensemble and let his shoes do the talking talking…they were blue! The woodland blessing was very personal to the couple and was filled with music and laughter. For a start, the guests were greeted with pink lemonade served from a cart by Cellar27 at the entrance to the woodland. A friend conducted the ceremony and songs including ‘I wanna be like you’ from The Jungle Book replaced traditional hymns. 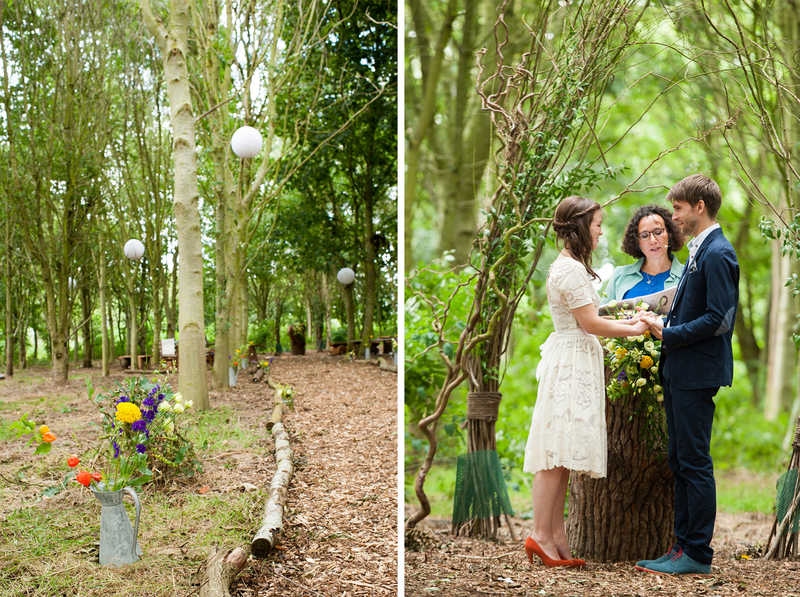 The atmosphere was magical and the natural woodland setting was a perfect fit for this couple. An array of white lanterns gently swayed in the breeze and jugs of wild flowers lined the woodland aisle. Nature was brought into the marquee with large silver birch trees on each central pole. The stunning wild flower table centre decorations were loving made by the mother of the bride and added colour to the tables. The tables each had a game in the centre and were named accordingly. Not only did the games amuse the guests it also added to the fun theme of the day. The couple opted for canapés followed by a simple buffet before guests were treated to a table of cakes made by the fabulous Cragg Sisters Tearoom, oh and there was ice cream! The speeches took place between each course starting with the father of the bride, the the groom, best man and the BRIDE also made speeches. We love the idea of the bride breaking with tradition to say a few words! After the wedding breakfast, in the early evening sun on the lawn by the marquee a selection of games were enjoyed by all. There were sack races, an egg and spoon race and of course wheelbarrow racing! Bella and Adam’s wedding celebration was certainly not traditional – they didn’t cut the cake or have a first dance and there were no hymns! There was however a lot of….LOVE! The atmosphere was relaxed and the mood reflected a celebration of the union of this lovely couple. The party started early and the dance floor was occupied all evening. Glamping guests then enjoyed an evening around the campfire and a hearty breakfast in the woodland. Here is a selection of images by Anna McCarthy Photography…. Posted in Real WeddingsBookmark the permalink.